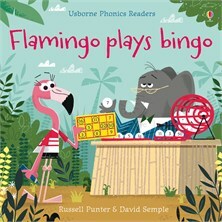 Flamingo can’t wait to play jungle bingo! But who will be crowned winner? This entertaining story for beginner readers has simple rhyming text and stylish illustrations throughout. A delight to share with very young children, or for beginner readers to read themselves, and with parent’s notes on phonics at the back of the book. Russell Punter was born in Bedfordshire, England. From an early age he enjoyed writing and illustrating his own stories. He later trained as a graphic designer at art college in West Sussex before entering publishing. Since then, he has written over fifty books for children, including original fiction in both picture book and young reader formats.